A 108-year-old TT trophy, normally kept under lock and key on the Isle of Man, is to make a rare journey to England for an exhibition of sports prizes. 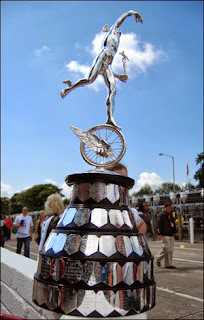 The Senior TT Trophy is usually only brought out for presentation following the annual race before returning to a secure location in Douglas. The trophy, which is insured for £1.5m, was presented to John McGuinness in June following his sixth race victory. It will feature alongside football’s FA Cup at the show at Ascot in Berkshire. The one-day exhibition will also feature the Ashes urn, which England and Australia contest in cricket, the World Snooker Championship Trophy and the Rugby League Challenge Cup. It will take place at the racecourse on 19 October. TT organiser Simon Crellin said it was “very rare for the trophy to leave the island”. 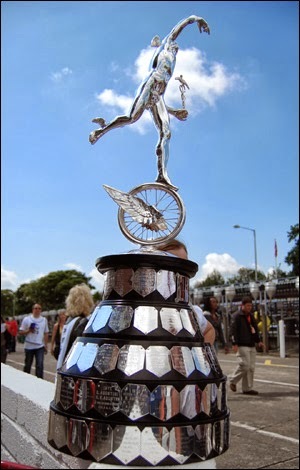 The silver trophy, first won by Charlie Collier in 1907, features Mercury, the Roman god of the messengers, on top of a winged wheel and has engraved shields detailing the winner of every race. ‹ Port Soderick looking beautiful.